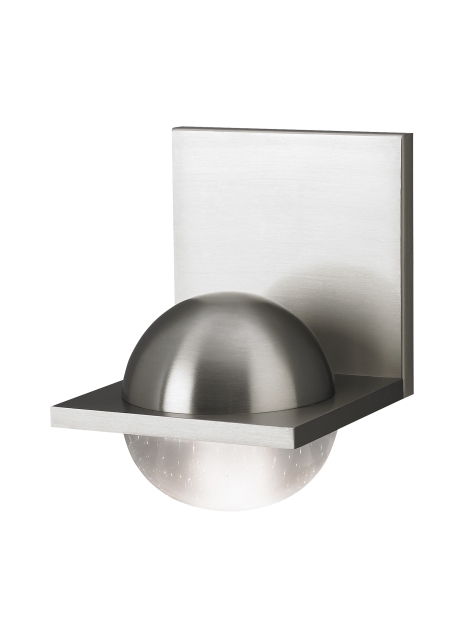 The Sphere wall sconce light from Tech Lighting features a square back-plate that’s perfectly contrasted with its spherical glass shade and heat sink. With a wholly modern silhouette design the Sphere Wall is the perfect lighting addition to spaces such as hallways, bathrooms and closets. Though modest in size the Sphere Wall generously provides light in any space with its proprietary warm color dimming LED module. This integrated LED lighting module gradually changes color from 3000K to 2200K as it dims to mimic the soft glow of traditional halogen lamping. Also included in the Sphere family is the Sphere Flush Mount, simply search for the Sphere Wall to find its closest relatives. LED includes 9 watt 500 lumen 90 CRI warm color dimming 3000K-2200K LED module. Dimmable with a standard incandescent dimmer or low-voltage electronic dimmer. Mounts up or down. ADA compliant. Dimmable with a standard incandescent dimmer or low-voltage electronic dimmer.